Pluck the basil leaves and add to quark and lemon juice in a mixer, puree as finely as possible. Transfer to a bowl. Whisk the egg whites well. Gradually add sugar. Add the beaten egg whites to the basil quark. Fill 4 STAUB cast iron dishes with parfait and leave in the freezer for about 4 hours. In the meantime, clean and wash the strawberries, and cut in halves or quarters depending on their size. Marinate the strawberries in powdered sugar and Grand Marnier. 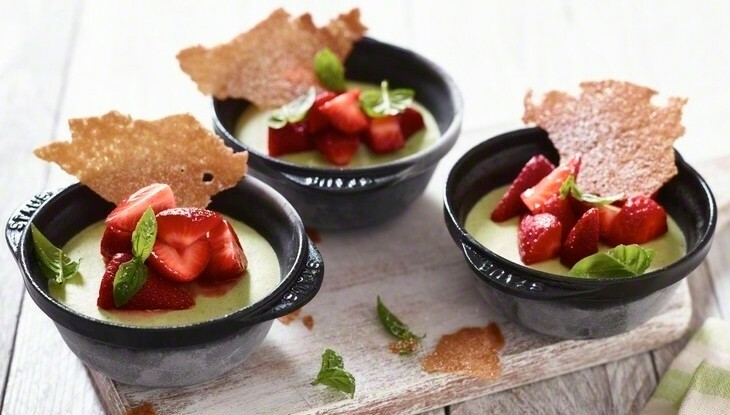 Remove the basil parfait from the freezer, allow to thaw, add the marinated strawberries on top and decorate with some freshly plucked basil leaves to taste, sprinkle with some powdered sugar. Crispy baked sugar leaves are a nice and tasty garnishing for this summery dessert. Mix 25 g soft butter with 75g brown sugar, egg white and 25g flour till smooth. Spread the mass as thinly as possible on a silicon baking sheet and bake in the oven at 180°C for about 8 minutes until golden brown. Then let it cool and break down into many pieces.